There are significant opportunities in this rapidly growing sector for Overseas Nurses. Salaries are now close to those paid in hospitals. Aged Care needs capable management, resulting in significant opportunities for nurses. The environment is less stressful and a more supportive than hospitals. 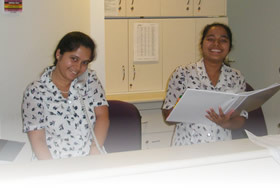 Aged Care Management is supportive of their Registered Nurses. This provides the nurse with stability and.. Whether or not you stay in age care, you will learn skills in Aged care that you will be able to utilise in other sectors of nursing. Communication Skills-staff, relatives and families will depend on your proficiency in communications. Caring for Aged Patients-Patients over 55 years of age account for 50.3% of patient admissions and 60.2% of patient days in public and private hospitals in Australia annually. Skills in know how to communicate with this large group are essential to good acute care nursing.